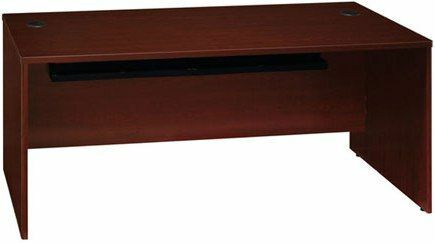 Bush QT0705CS Quantum Harvest Cherry 72" x 30" Desk Shell, 6 ½" overhang on the front of the desk, 2 Wire grommets for cable management, Harvest cherry finish, Melamine construction, Durable Diamond Coat Work surface, 30.00" H x 47.38" W x 42.13" D Dimensions. This modern computer desk is a great way to start off your office. It features two wire grommets for cable management and a durable Diamond Coat work surface. It also has plenty of expansion options to create a fully functional computer workstation. The desk shell comes in a Harvest Cherry finish, and is ready to assemble using the Install Ready system.